Dial phone numbers from your database for appointment reminders, scheduled deliveries, or debt collection. Provide custom messages for each call, and route calls to a customer service representative. 3CX Dialer was designed from the ground up specifically for 3CX. 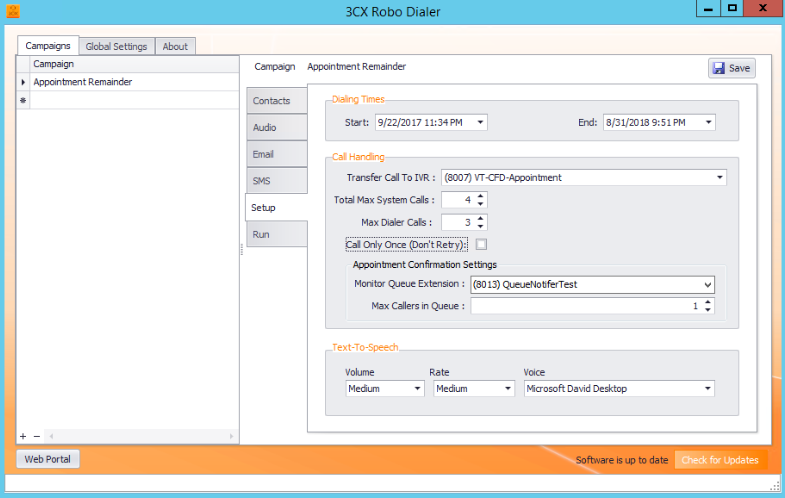 With 3CX Dialer you can automate the unattended calls to patients, customers or students using unique contact lists (campaigns). When used in conjunction with Call Flow Design (CFD) applications, virtually any scenario can be supported. 1.1. How do I Install the Dialer? VoipTools will give you a download link and license key after purchase. You can simply go through the simple installer to proceed with the installation. 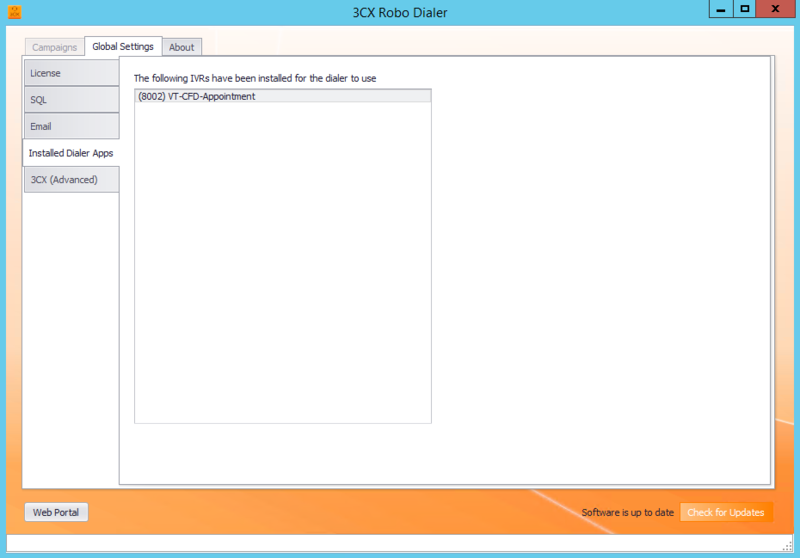 Since the add-on ‘3CX Robo Dialer’ includes a CFD application, you will need to install either Pro or Enterprise version of 3CX. You can run Abyss, IIS, and NGIX on the same server. To store audio files of ‘Play Announcement’ and ‘Transfer Call’, you need to create folders for each of them under the root path. 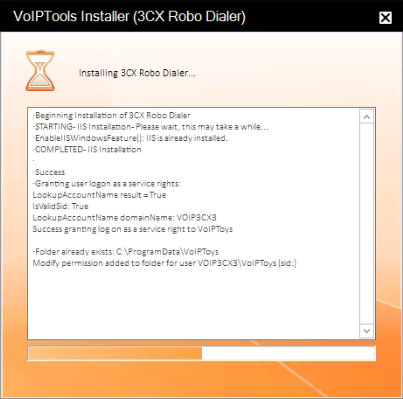 You can order 3CX Robo Dialer on-line at http://www.voiptools.com. Your order confirmation email will include your license key and a link to download the software. 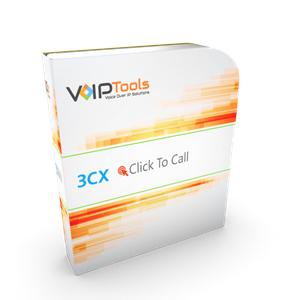 You must register your license key to activate 3CX Dialer. Your license key is included in your order confirmation email, and can also be found in your order history on our website. 1. The file you downloaded in the above step is a compressed .zip file. 2. Position the mouse on the zip file and right-click. 3. From the popup menu, select Extract All to extract the software. 2. Double-click the file to start the VoIPToys Setup Wizard. 2. 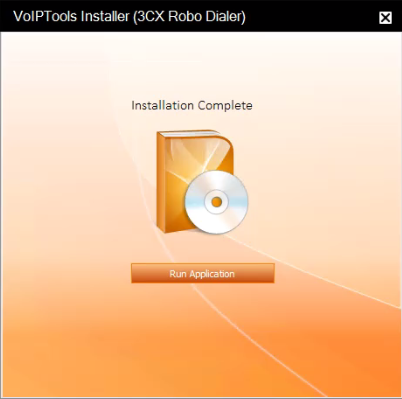 If you are installing 3CX Dialer directly on the 3CX server, you can install the Relay simply by clicking the Install/ Upgrade Relay button and following the Relay install instructions. 1. 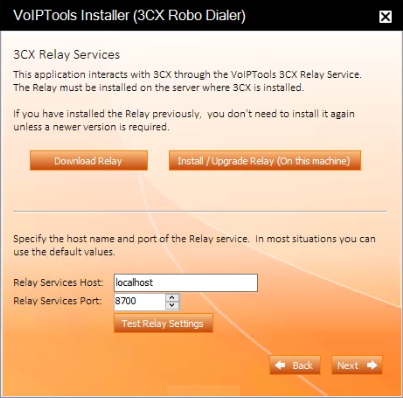 In the Relay Services Host field, enter “localhost” if installing 3CX Dialer on the 3CX server. If 3CX resides on a different server, enter the IP address or FQDN of the 3CX server. 3. 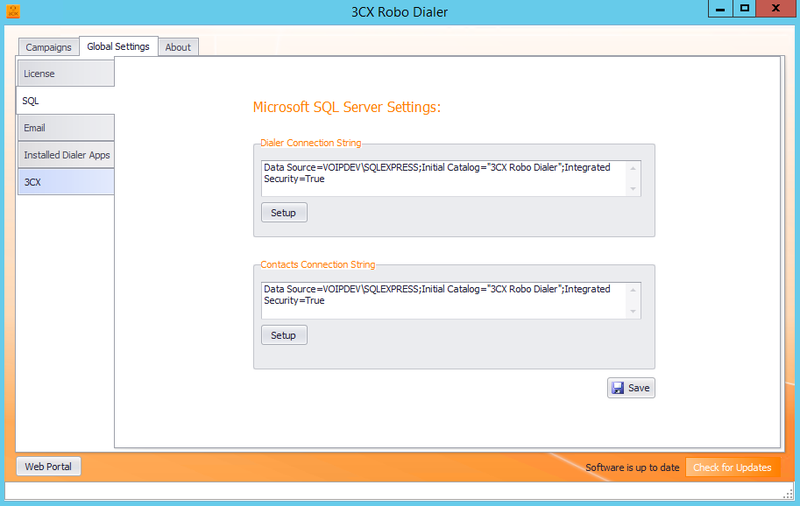 Click Test Relay Settings to confirm 3CX Dialer can communicate with the Relay services running on the 3CX server. 4. 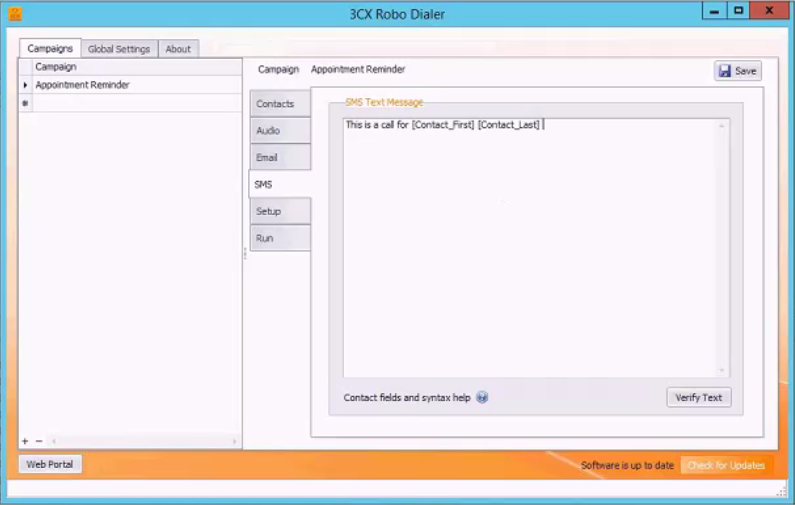 If the 3CX Dialer is successfully able to communicate with the Relay services that run on the 3CX server, Success message box appears. Click OK.
1. When prompted for the database connection information, click Configure button. 2. 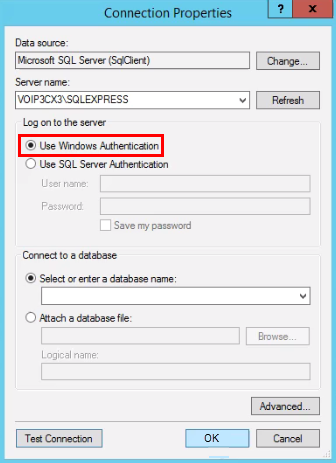 In the Connection Properties dialog box, enter the SQL server name. 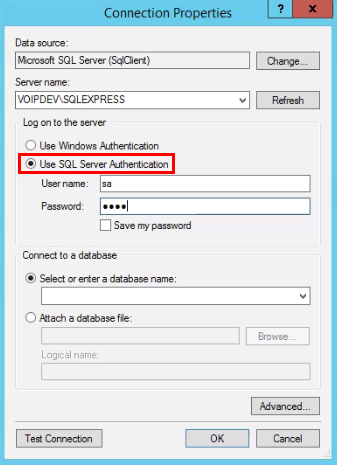 If using the free SQL Express edition, the default SQL Instance name is \SQLExpress. 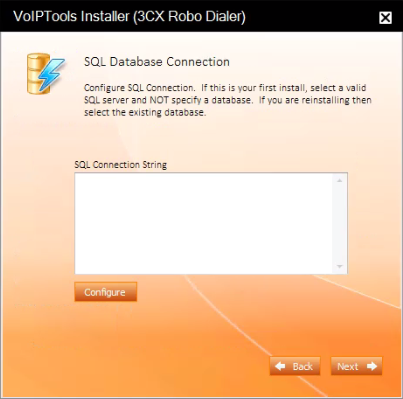 If SQL Server is installed on a server other than the server where 3CX Dialer is installed, you will need to configure SQL Server to allow remote connections. 3. 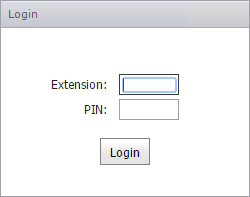 Enter the login credentials. When the software installation is done, click Run Application button. Global Settings screen enables you to register license for 3CX Dialer, configure Microsoft SQL Server Settings and Email Server Settings. You can also view the list of installed CFDs. 1. 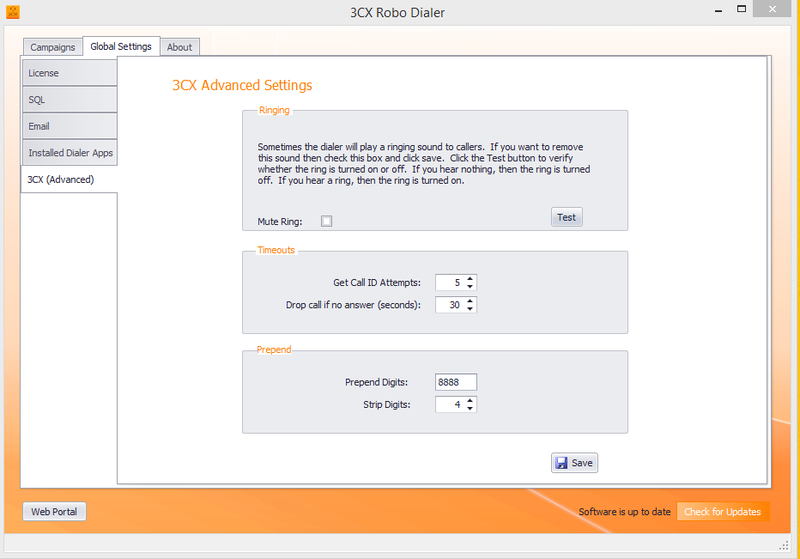 On the 3CX Dialer configuration screen, and in the Global Settings tab, select License tab. 2. Enter your registration information in all the fields (Note the red dot denotes a required field). 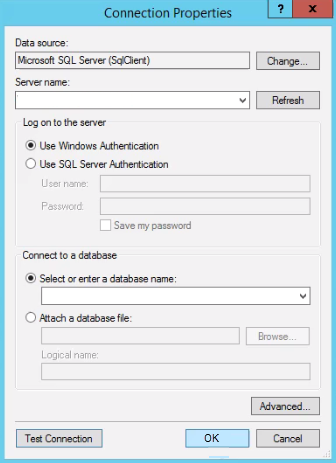 SQL tab enables you to configure Microsoft SQL Server Settings. The dialer uses the Contacts Connection String to connect to the required database and get the contact details. 1. In the Global Settings screen, click SQL tab. 2. 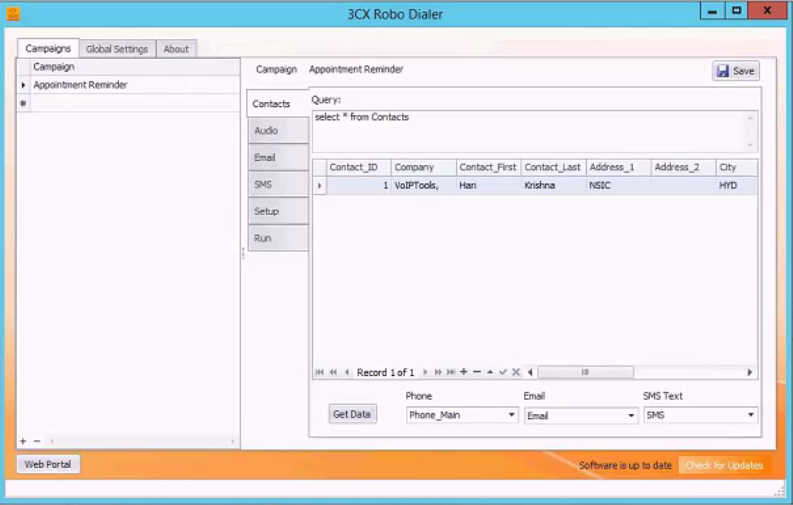 In the Contacts Connection String field, enter the connection string of the database from which you want to dialer to retrieve the contact information. 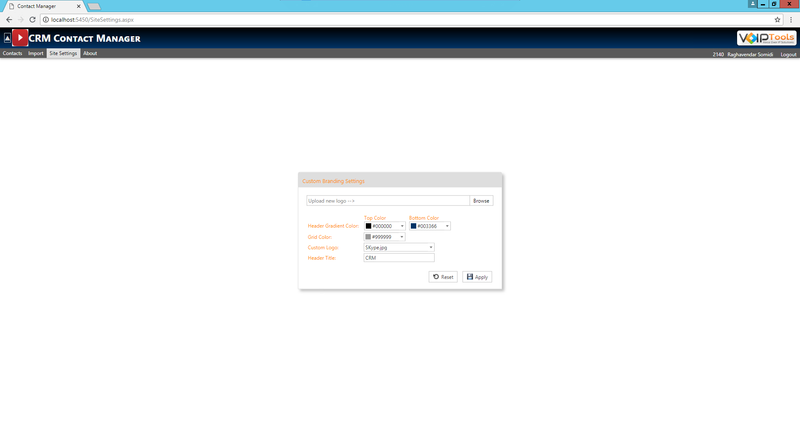 Email tab enables you to configure Email Server Settings. 1. In the Global Settings screen, click Email tab. 2. In the Mail Server field, enter the IP address or ‘Fully Qualified Domain Name’ (FQDN) of your email server. 3. In the Port field, enter appropriate port number. Default port number is 25. 4. In the Email From field, enter reply email address for email and SMS text notifications. 5. In the Email Subject field, enter the subject for the email. 6. In the Test Email To field, enter valid test email address. 7. In the Notification Email field, enter the email address to send an email about call data once you complete a campaign. The data includes details like number of calls answered, unanswered and failed in that campaign. 8. In the User and Password fields, enter the username and password of your email address. 9. Click Test to send a test mail and check if you have successfully configured the email server settings. 10. Check Requires SSL check box if your server requires a secure connection to relay email. 11. Click Save to save the ‘Email Server’ settings. Installed Dialer Apps tab display a list of CFD that have been installed for the dialer to use. 3CX tab enables you to configure ringing sound and timeout settings for 3CX. The Ringing section enables you to configure ringing sound settings. 1. In the Ringing section, check Mute Ring check box to mute the ringing sound. 2. Click Save to save the setting. 3. Click Test button to verify whether the ring is turned off. 1. Uncheck Mute Ring check box to unmute the ringing the sound. 3. Click Test button to verify whether the ring is turned on. The Timeouts section enables you to configure call timeout settings. 1. In the Timeouts section and in the Get Call ID Attempts box, set the desired number so that if the call is not received, then the call attempts will be made as per the set number of times. 2. From the Drop call if no answer (seconds) box, set the desired number (in seconds) so that if the call is not received within the set number of seconds, then the call will be dropped. 3. Click Save to save the Timeout settings. 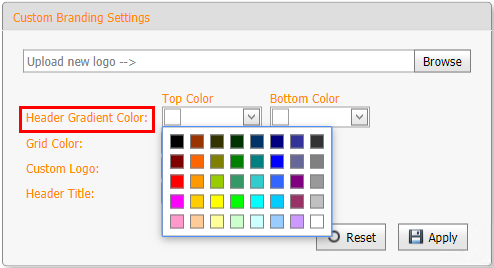 The Prepend section enables you to configure ‘Prepend’ settings. When you call a number, the ‘Robo Dialer’ will add the ‘Prepend Digits’ to the beginning of your phone number. The ‘Strip Digits’ defines the number of prepend digits and you should set it manually. 1. In the Prepend section and from the Prepend Digits field, set the desired value so that when you attempt to call a number, the Robo Dialer will prepend the digit to your number. 2. In the Strip Digits box, set the value to the number of prepend digits. 3. Click Save to save the Prepend settings. 1. 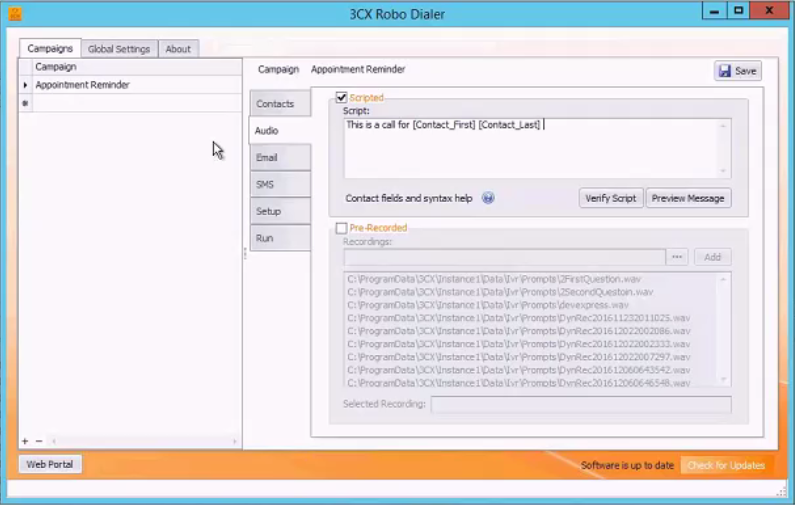 In the 3CX Dialer configuration screen, click Campaigns tab. 2. On the left hand side, in the Campaign field, enter campaign name. i. On the right hand side, click Contacts tab. ii. In the Query field, type appropriate ‘SQL Query’ to retrieve the desired contact details from the database. iii. Click Get Data button to view the contact data retrieved from the database. You can configure any one or two or all of ‘Phone’, ‘Email’ and/ or ‘SMS’ so that the dialer responds accordingly. iv. From the Phone dropdown, select the appropriate column name that represents the phone number so that the dialer uses the number specified in that column to make a call. v. From the Email dropdown, select the appropriate column name that represents the email address so that the dialer uses the email address specified in that column to send the email message. vi. From the SMS Text dropdown, select the appropriate column name that represents the SMS text so that the dialer uses the number specified in that column to send the SMS text. vii. On the upper right corner of the screen, click Save to save the contact. Audio tab enables you to choose ‘Text-To-Speech’ or ‘Pre-Recorded’ audio file to play the message when a dialer makes a call to the contact. i. Check Scripted check box to enable ‘Text-To-Speech Audio’ to play as message when the dialer makes a call to the contact. ii. Type the text that you want the dialer to play as message when the contact receives the call. Click Help button to include appropriate column rows in your text so that the dialer uses the column data while performing ‘Text-To-Speech’. iii. 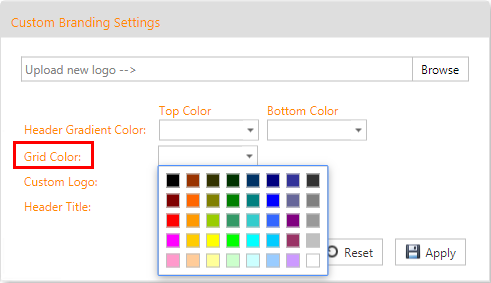 Select appropriate column and click Copy to Clipboard. iv. Place the cursor in the script area where you want to paste the column row and on your keyboard, press ‘Ctrl + V’ to paste. v. Click Verify Script button to verify if you have created the script for the correct contact. vi. Click Preview Message button to play the message for yourself so that you can hear what it sounds like and make necessary changes if required. i. Check Pre-Recorded check box to enable ‘Pre-Recorded Audio’ to play as message when the dialer makes a call to the contact. ii. From the Recordings list box, select appropriate pre-recorded audio file. iii. On the upper right corner of the screen, click Save to save the ‘Pre-Recorded’ message. 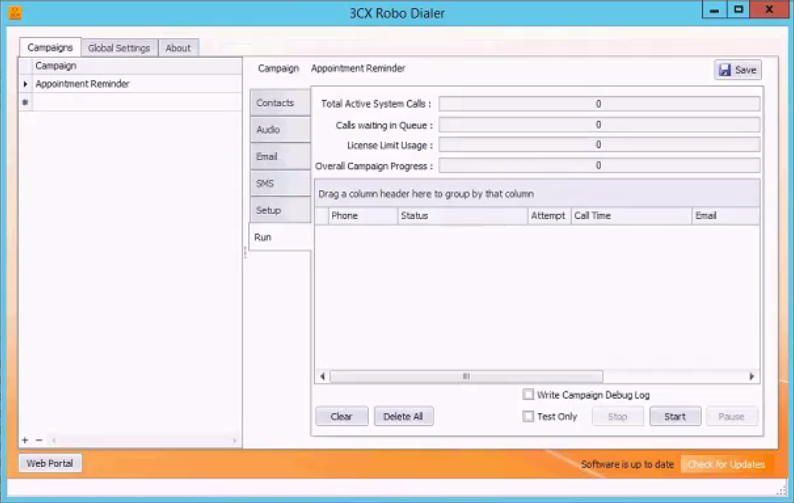 v. On the 3CX Dialer configuration screen, and in the Campaigns screen, click Audio tab. vi. Check Pre-Recorded check box. vii. 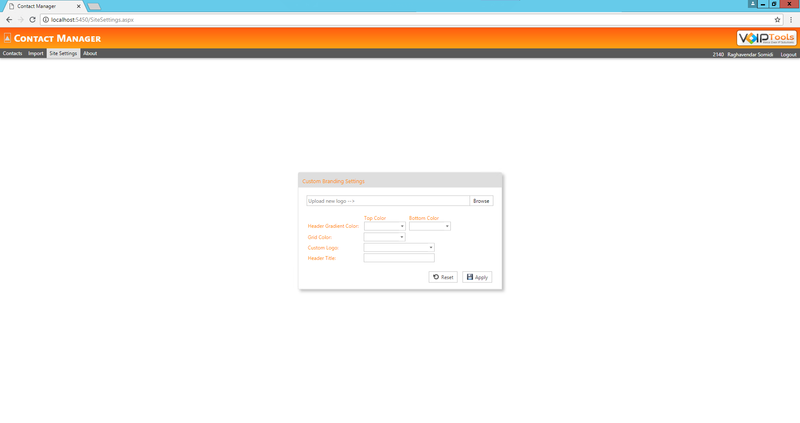 Click Browse button and browse for the pre-recorded file that is located in your local system. viii. Click Add button to add the pre-recorded audio file to the Recordings list box. ix. On the upper right corner of the screen, click Save to save the ‘Pre-Recorded’ file to the Recordings list box. 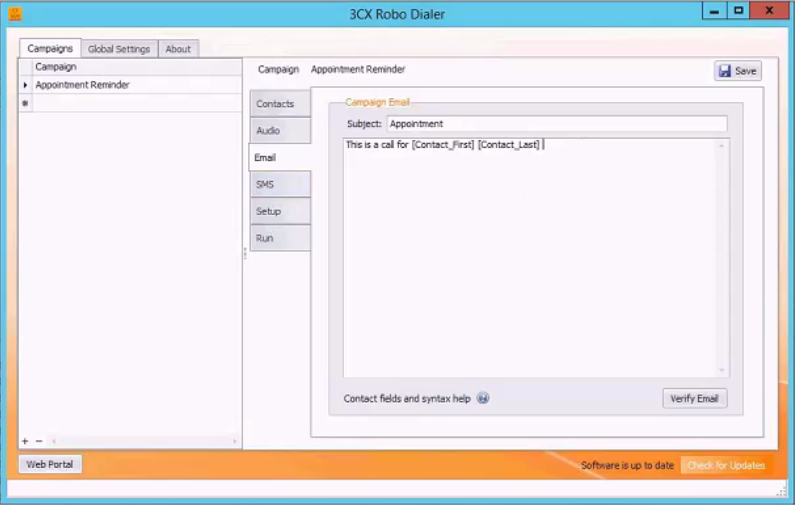 Email tab enables you to compose a Campaign Email that you want to send to the desired contact(s). i. In the Subject field, enter the subject for the email. ii. In the email text area, type the email message. Click Help button to include appropriate contact fields in your email text so that the dialer includes appropriate data in the email message. iv. Place the cursor in the email text area where you want to paste the selected contact field, and on your keyboard, press ‘Ctrl + V’ to paste. v. Click Verify Email button to preview the email message and make corrections if necessary. vi. On the upper right corner of the screen, click Save to save the email message. SMS tab enables you to compose a SMS Text Message that you want to send to the desired contact(s). i. In the SMS text area, type the SMS Text Message. Click Help button to include appropriate contact fields in your SMS text so that the dialer includes appropriate data in the SMS text message. ii. 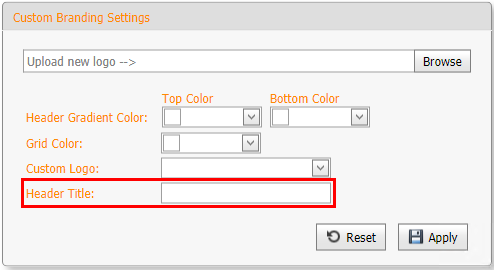 Select appropriate column and click Copy to Clipboard. iii. Place the cursor in the email text area where you want to paste the selected contact field, and on your keyboard, press ‘Ctrl + V’ to paste. iv. Click Verify Text button to preview the SMS Text Message and make corrections if necessary. v. On the upper right corner of the screen, click Save to save the SMS text message. 2. Play Announcement: Call the contact, play a message and hang up. Typical use cases include public emergency notices, political campaign announcements, reminders, etc. 3. Transfer Call: Call the contact, and immediately transfer the call to an extension. This is used primarily for sales cold calls. i. In the Setup tab and in the Dialing Times section, click Start time box and select the time at which you want to start the dialer. ii. Click End time box to select the end time at which you want to end the dialer. iii. In the Call Handling section, from the Transfer Call To Dialer App dropdown, select the desired option to which you want to send the dialer to. a. From the Total Max System Calls box, type or select the maximum number of active PBX calls so that when this number is reached, the dialer will not make calls. If the entire PBX has this many active calls (Total Max System Calls) then the dialer will pause making calls. 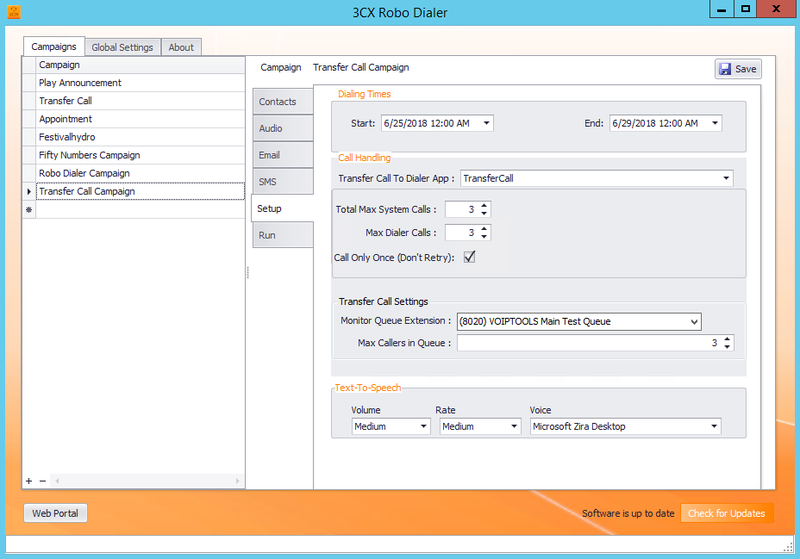 This setting is used to ensure that the dialer does not consume all the available 3CX simultaneous calls. 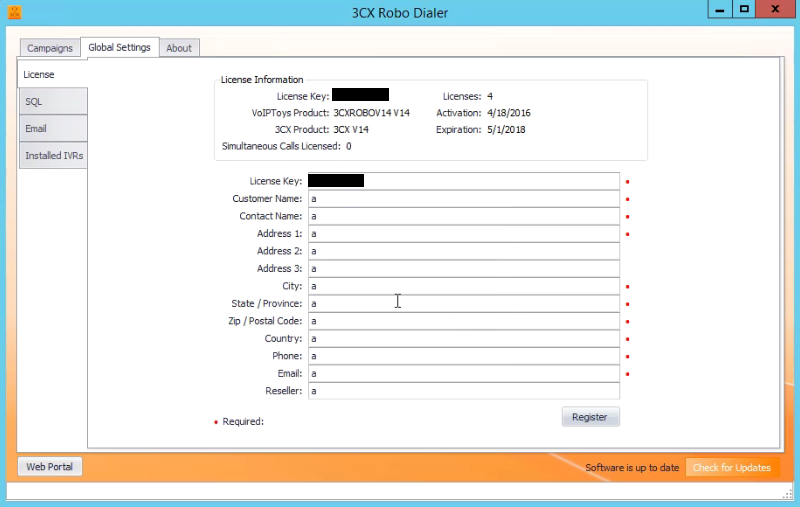 For example, if you want to be sure there are always 4 lines free for non-dialer calls and you have 16 SC 3CX license, then enter 12 for this value. b. From the Max Dialer Calls dropdown, type or select the maximum number of simultaneous calls the dialer can make. c. Check the Call Only Once (Don’t Retry) check box if you want the dialer to attempt the simultaneous call only once and does not retry. a. Under Appointment Confirmation Settings section, and from the Monitor Queue Extension dropdown, select the queue to which you want the dialer to transfer the contact. b. From the Max Callers in Queue dropdown, type or select the maximum number of people permitted in the queue. Once this number is reached, the dialer will not make calls. In other words, this enables you to automatically pause the dialing if too many people are waiting in the queue. a. Under TransferCall Confirmation Settings section, and from the Monitor Queue Extension dropdown, select the queue to which you want the dialer to transfer the contact. vii. In the Text-To-Speech section, from the Volume dropdown, select the type of volume you want the dialer to use while delivering the audio message to the contact. viii. From the Rate dropdown, select the rate of speed of text-to-speech you want the dialer to use while delivering the audio message to the contact. ix. From the Voice dropdown, select the type of text-to-phone-speech voice you want the dialer to use while delivering the audio message to the contact. x. On the upper right corner of the screen, click Save to save the dialer call setup configuration. Run tab enables you to test, start, pause or stop the dialer call. Parameters like Total Active System Calls, Calls waiting in Queue, License Limit Usage and Overall Campaign Progress display details in live while the dialer call is in progress. i. Click Start button to enable the dialer to run the call according to the parameters you set in Contacts tab, Audio tab, Email tab, SMS tab and Setup tab. ii. Click Pause button if you want to pause the dialer in making further calls to the campaign. iii. Click Stop to stop the dialer from making calls to the campaign. iv. Check Test Only check box if you want to simulate the dialer call so that you can preview how the dialer makes the call. v. Click Clear button to clear the call logs history. vi. Click Delete All button to delete all the call logs. The web portal is a ‘Contact Manager’ that helps you to manage contact details of your customers. 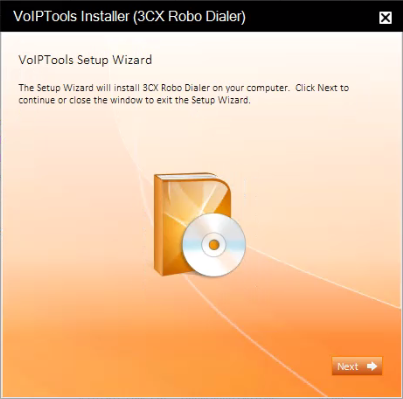 To access the ‘3CX Dialer’ web portal, click the Web Portal button on the configuration program, or click on the desktop icon that was created during the installation process (3CX Dialer Web). i. View Contacts, Import and About screens. ii. In the Contacts screen, you can search for a specific record from the grid, delete list name, add a new contact, add an appointment for a contact and specify action for an appointment. iii. 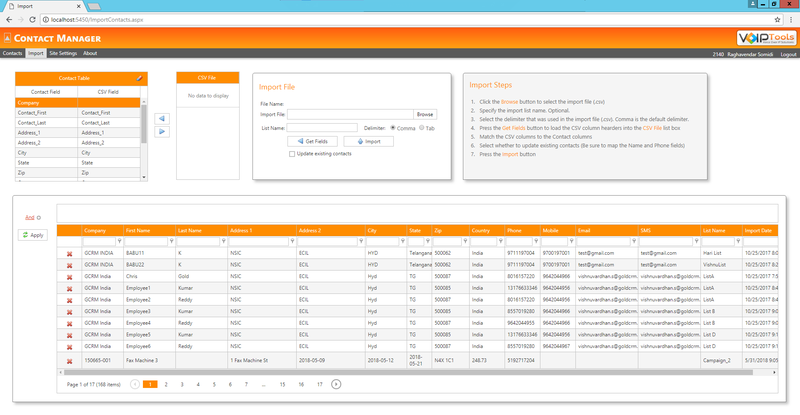 In the Import screen, you can import contacts from a CSV file into the central repository of contacts. i. View only Contacts, and About screens. ii. In the Contacts screen, you cannot select list name to delete. Contacts screen enables you to search for a specific list, select list name to delete (only for ‘Manager’ role), add a new contact, add an appointment for a contact and specify action for an appointment. i. In the Contacts screen and on the column header, click Add button. ii. In the Company field, enter the company name of the contact. iii. In the First Name and Last Name fields, enter the first and last name of the contact. iv. In the Address 1, Address 2, City, State, Zip and Country fields, enter the address details of the contact. v.	In the Phone field, enter the phone number of the contact. vi. In the Mobile field, enter the mobile number of the contact. vii. In the Email field, enter the email address of the contact. viii. In the SMS field, enter the phone number of the contact to which you want to send the SMS message. ix. Click Save to save the contact details. i.	Click Expand button beside the contact to which you want to add the appointment. ii. 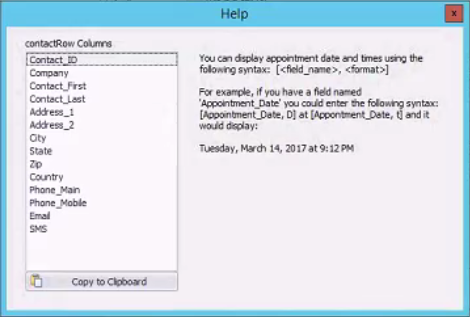 In the column header, click Add button to add new appointment for the contact. iii. From the Appointment Type dropdown, select the type of appointment that you want to add for the contact. iv. From the Date Start calendar, select the start date and time at which the appointment starts for the contact. v.	From the End Date calendar, select the end date and time at which the appointment ends for the contact. vi. The Appointment Status field automatically displays the appointment status. vii. Click Save to save the appointment. ii. Click Expand button beside the appointment for which you want to specify the action. iii. From the Date calendar, select date and time at which you want to perform the action. iv. From Action dropdown, specify the desired action that you want to specify for the appointment. v.	Click Save to save the action for the appointment. i.	Log into the ‘3CX Dialer’ Web Portal with ‘Manager’ credentials. ii. In the Contacts screen, and from the Select list name to delete: dropdown, select the list name that you want to delete. iii. Click Delete button to delete the list. All the records with the selected List Name will be deleted. You can access Import screen only as a ‘Manager’. Here, you can import contacts from a CSV file into the central repository of contacts. ii. In the Import screen, beside Import File field, click Browse button to select the import file (.csv). iii. In the List Name field, enter the name for the contact list. If you do not specify List Name, then the contact will be created without a list name. iv. Select the Delimiter option according to the one that you have specified in the import file (.csv). v.	Click Get Fields button to load the CSV column headers into the CSV File list box. vi. Move each one of the columns from the CSV File list box into the CSV Field list box by appropriately using and buttons such that the columns in CSV Field list box will match with those of Contact Field list box. vii. If you want to overwrite existing contacts, check Update existing contacts check box. Be sure to map the Name and Phone fields. viii. Click Import button to import all the contacts from the CSV file into the central repository of contacts. To access co-branding features of the web portal, you should log in as a ‘3CX System Admin’ or an ‘Extension Group Manager’. As an agent, you will not be able to view the ‘Site Settings’ menu. 2. Once you perform desired customization, click Apply. 3. To reset to default settings, click Reset.